The first event of the Horizons-Seminars2019, the series of seminars for students held by students, was held in Room A of the Department of Physics Unit on 03/27/2019. In the words of the organizers: "This series of seminars aims to explore, one by one, the most interesting advances and results in physics, every drop of curiosity daily flowing from the edge of research, from the edge of knowledge." Brainchild of a group of students of our Department, together with prof. Fulvio Parmigiani, the initiative was well received by students: around 50 people attended the debut event, well beyond expectations. The event has gained support from different institutions: from the direction of the Department in the person of the director prof. Giovanni Comelli, immediately enthusiastic about the idea, to the University of Trieste, which provided full cooperation in spreading and advertising the event. In the introductory speech prof. Parmigiani summarized the spirit of the initiative by inviting students to "slowly raise heads from toes and look at the sky". Two 30-minutes seminars followed. The first one, held by Vito Dichio and Enrico Drigo, both students attending the first year of master's degree in our CdL, was named "Networks: Unveiling Complexity". The presentation introduced the audience to network theory and the study of complexity: a modern, interdisciplinary field of research born and developed in the last twenty years. The second one, held by Alfredo Fiorentino, of the first year of our master's degree, had the title "Anomalous Diffusion And Fractional Calculus ": starting from the physics of the anomalous diffusion phenomenon, the speech investigated the tools of fractional calculation and how they emerge in the description of nature. Given the large participation for the debut event and the widespread enthusiasm for the initiative, in the next months it will go on developing new seminars and exploring new borders of the modern research in physics. This is the link for the Telegram channel to follow this initiative: https://t.me/HorizonsSeminars and the slides of the two interventions are available among the attachments. Horizons-Seminars2019 stems from a talk, from a deep thought, from a urgency: the need to expand students' interests beyond the (limited, inevitably) range of topics of everyday's didactics. 30-minutes seminars, held by students for students, about non-standard topics of modern physics. Spelunking in the research-worlds, this series of seminars aims to explore, one by one, the most interesting advances and results in physics, every drop of curiosity daily flowing from the edge of research, from the edge of knowledge. The Quantum Café is an interdisciplinary and inclusive activity, intended for the general public, that combines science, music and theater to enhance public participation in the scientific arena and offers food for thought on quantum mechanics. 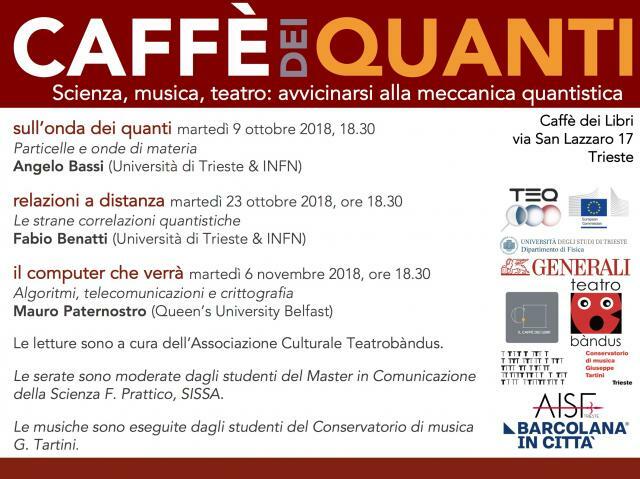 The Quantum Café will benefit from the participation of Trieste top theatre and music performers, besides academic elite. Many young people involved, with the participation of the students of the Music Conservatory G. Tartini of Trieste and those of the SISSA Master Course in Science Communication F. Prattico. Professors of the University of Trieste & INFN and Queen’s University Belfast will deliver scientific talks on quantum mechanics. The first evening of the Quantum Café is an official event of Barcolana 2018. The Quantum Cafè is a science popularization, in the frame of his research project TEQ “Testing the Large Scale Limit of Quantum Mechanics”, that started in 2018 thanks to a sizeable H2020 grant. This initiative falls within the largest spectrum of scientific cafes of the University of Trieste for the fall 2018.